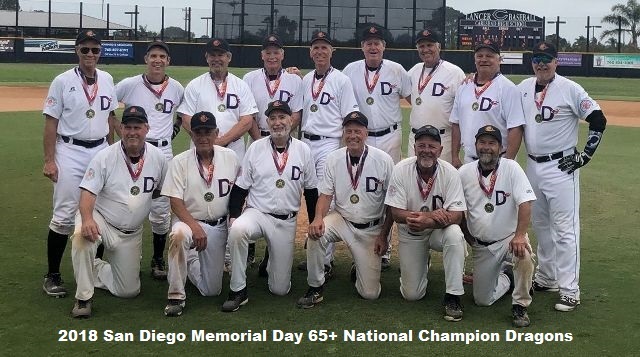 The 8th annual MSBL San Diego Memorial Day Weekend Fun Tournament was a 60+ wood bat tournament. Playing doubleheaders over the 3-day weekend with pool play Saturday-Sunday and single elimination playoffs on Monday, we played on four spectacular fields: Carlsbad High School’s Ralph Cripe Field, Escondido High School, Palomar College and UCSD’s Triton Field. Reacting to excellent feedback we get from our players and managers, we hear our family-oriented tournament is still their favorite to play in the West. This year’s tournament featured teams from Arizona, Los Angeles, New Mexico, Northern California, San Diego and Seattle. New teams were welcomed from Arizona (Western Diamondbacks) and Coronado (San Diego Seals). Players, spectators and families once again enjoyed the famous Rockin’ Jenny’s sandwiches, barbecued Costco dogs, Zappy’s Pizza on Monday and another 1,000 or so homemade brownies by the San Diego bakers’; contingent of Ann McMillan, Bonnie Miller, Missy Knudsen and Ms. Ray Andre. We look forward to the 9th annual tournament May 25-27, 2019.